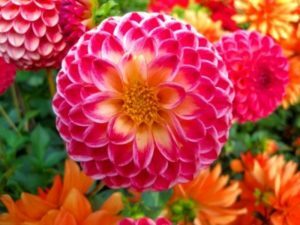 Dahlia flowers are perennial flowers that showcase in the summertime. They begin their growth in the summer, and can continue to grow into the fall months. They typically grow in Central America and Mexico. They grow at their best in the warmer months and can stick around all the way through to the first frost. Dahlias come in a variety of shapes, sizes and colors. Some colors are yellow, pink, white, orange, coral, and lavender. Dwarf varieties grow to be around 10 inches tall, while other types can be 7 feet tall! When you are ready to plant them, make sure the area is located in a place where the plant will receive at least 6 hours of sun a day. Also make sure the soil you are planting them in is moist. While they do grow best in moist, fertile soil, it should be well drained and not to wet. If the soil gets to wet, the flowers will have trouble growing, if they even grow at all. Space the plants 2 to 3 feet apart when planting in the warm spring air. Dig them about 6 inches deep into the soil. If you are growing regular sized plants, they will need to be staked. Dwarf varieties will grow fine without staking. When covering the hole, do not cover the entire hole with dirt. Leave about an inch or two showing at the top. When they begin to grow, cut back the plant as needed, and cultivate the area to promote growth and retain water. 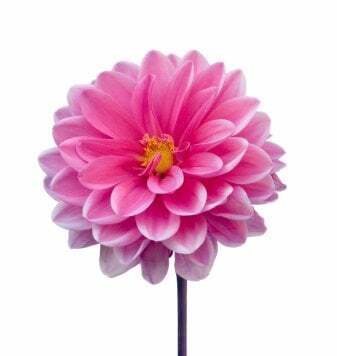 There are many different classes of Dahlias. Below, I will describe the more popular types that you are more likely to see growing. Laciniated: One of the more bushy looking flowers of this species. It has a fringed looking flower head and resembles quills of porcupine. Ball: A pompom shaped ball of a flower head. Tight ray florets make up this flower. Orchid: A single row of petals surrounding the center. This flower resembles blades on a fan. Single: A row of petals surrounding the center disc. The petals slightly overlap each other. Waterlily: Several rows of overlapping petals that tilt upwards. In the center there is a tightly bound ball of smaller petals. Collarette: Resembles a single. Made up of a center disc that is surrounded by small petals, larger petals surround the smaller petals. Peony: Resembles the waterlily species. There are several rows of overlapping petals that surround a center disc. Whatever color, variety, or size you choose, the Dahlia is a wonderful flower to grow. You can enjoy them in a garden or in your home. After all, they look beautiful in an arrangement of fresh cut flowers.